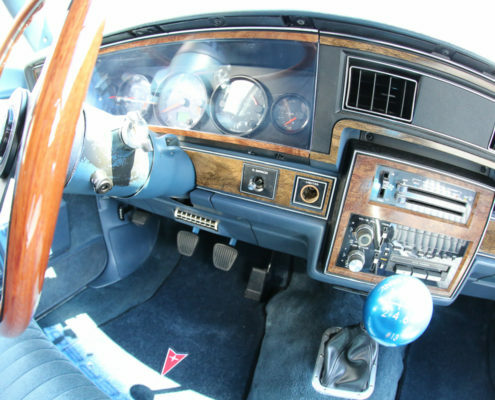 Well we finally got around to tidying up the interior of our 1989 Pontiac Safari station wagon, Shaken & Stirred. 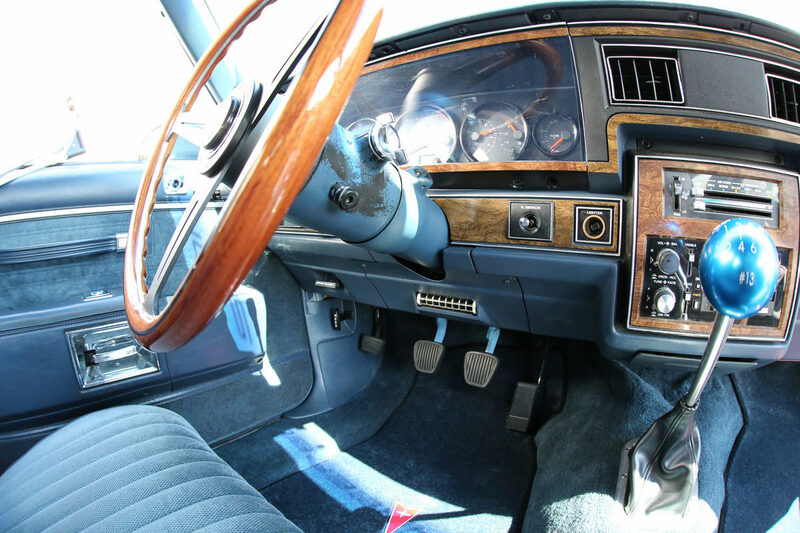 Until this moment, when showing the car off we’d say things like “pretend the interior is invisible” and “the previous owner was experimenting. Mainly with acid, but a little with carpet too.” No more qualifiers. Except we haven’t finished the headliner, other than that we’re all good! 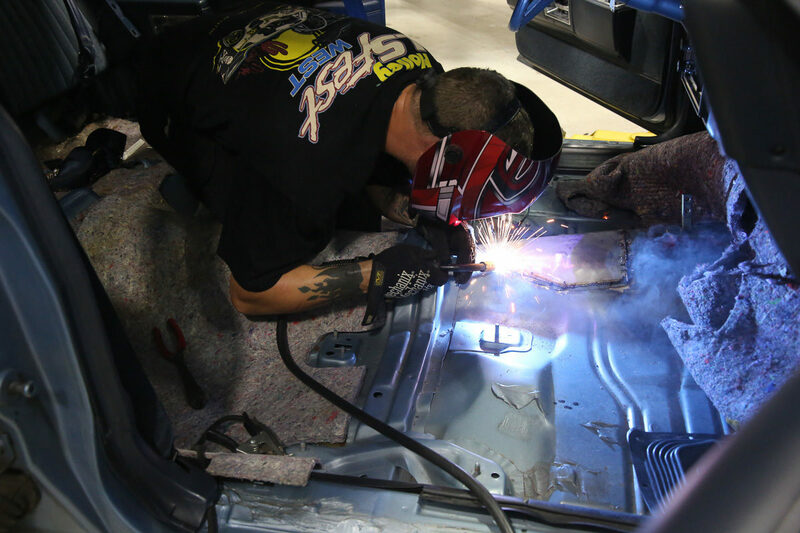 Before installing the carpet, we welded up our floor bubble, required to fit the Tremec T56 Magnum 6 speed manual transmission. The new carpet alone made an amazing difference inside the car. The Lloyd Mats are phenomenal, in photos it’s a little hard to capture the thickness. 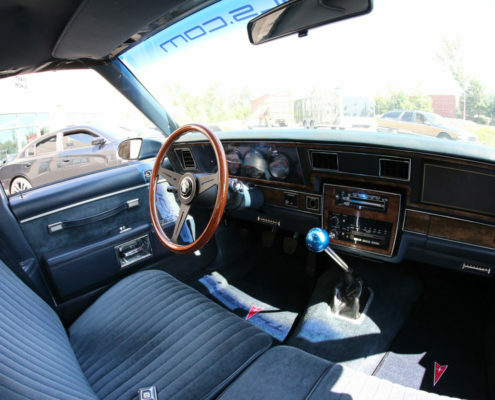 The Pontiac trident stitching is perfect and nicely inset in the plush mats. Lloyd Mats specializes in customizing and embroidering so let us know what we can pull together for you. 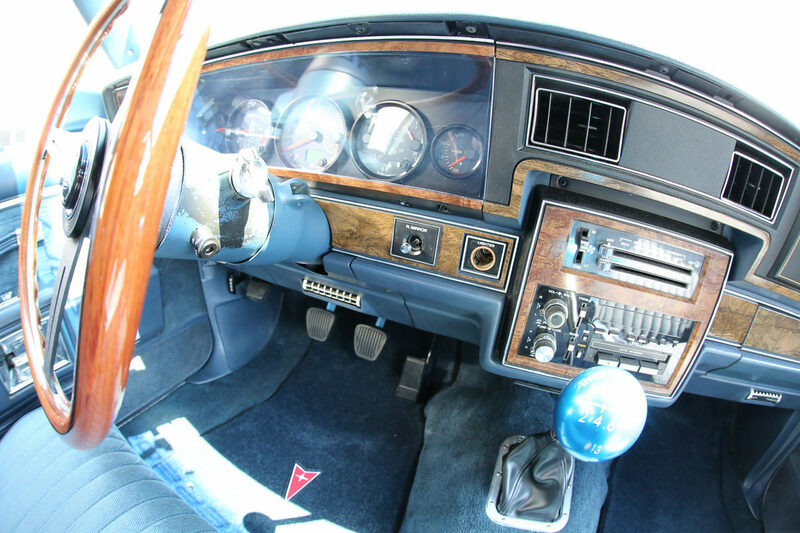 Given the extremely utilitarian value of such a large wagon, we just had to retain the bench seat, and the front most shifter location of the T56 Magnum is perfectly situated to allow just that. 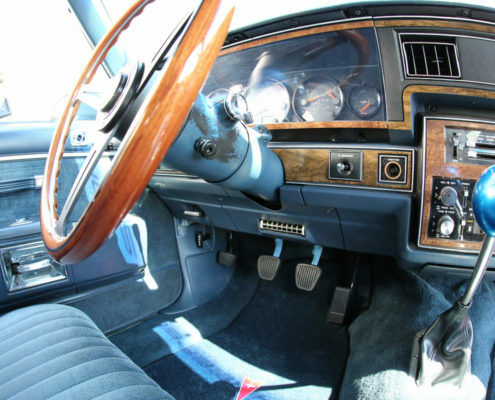 But, what to do about a center console? 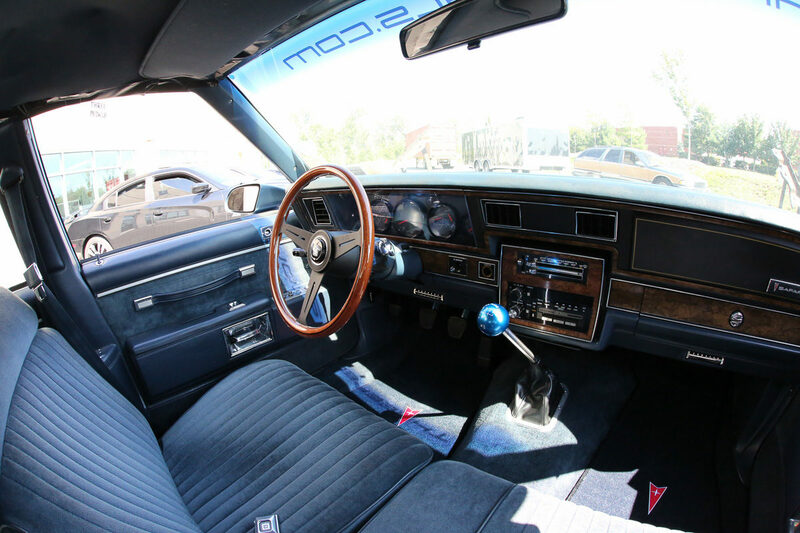 We solved the problem by fabricating a hidden retaining ring, below the carpet, and our shift boot bolts to this. Clean! When it came time to shift we couldn’t find a good off-the-shelf lever. 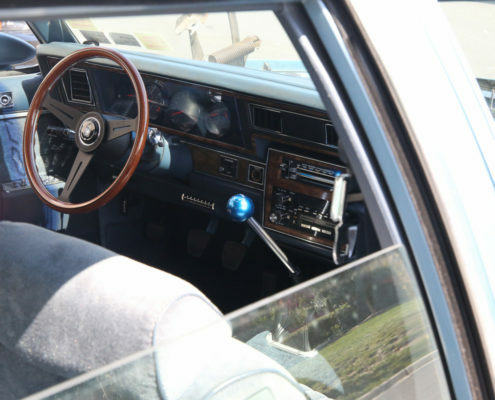 The best we could find, and which we ran at LS Fest West, caused two issues when hitting third: (1) the radio station would change and (2) fingers would be crushed. 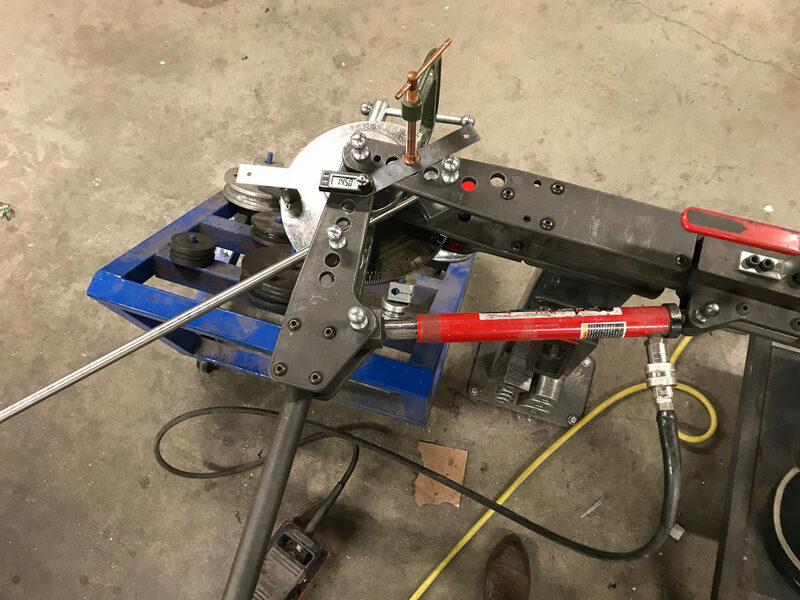 To solve the problem, we bent some 5/8” diameter stainless steel bar, milled a plate to bolt up to the T56 shifter, TIG welded the thing up, and polished it. 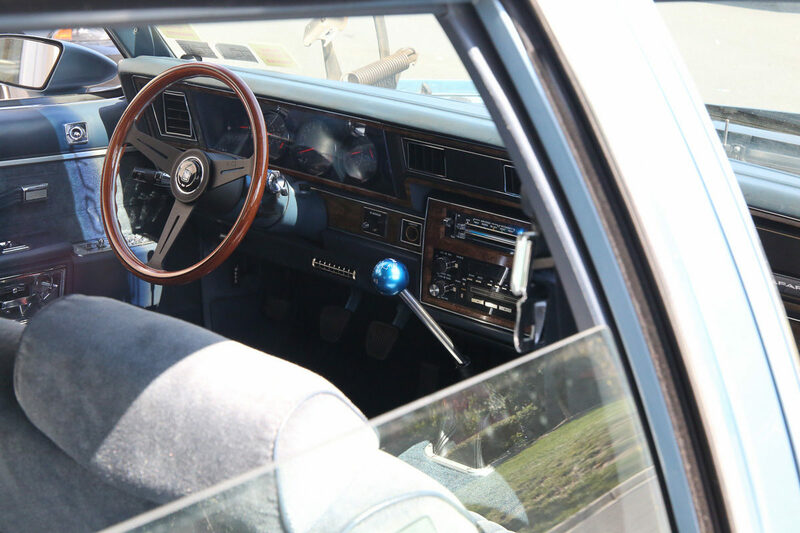 Our custom billet aluminum shift knob goes well with it, we think. 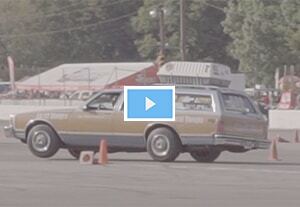 We number every car that we convert from two pedals to three pedals, and Shaken & Stirred is #13. Lucky 13! 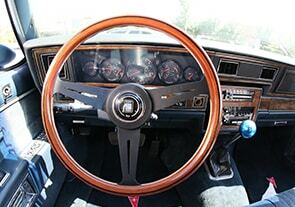 The steering wheel is a wood and aluminum piece from Nardi and it really pops in person. The wood is beautiful and the wheel is smooth. So smooth in fact that for track time we’ll keep a set of driving gloves in the – wait for it – glove box. 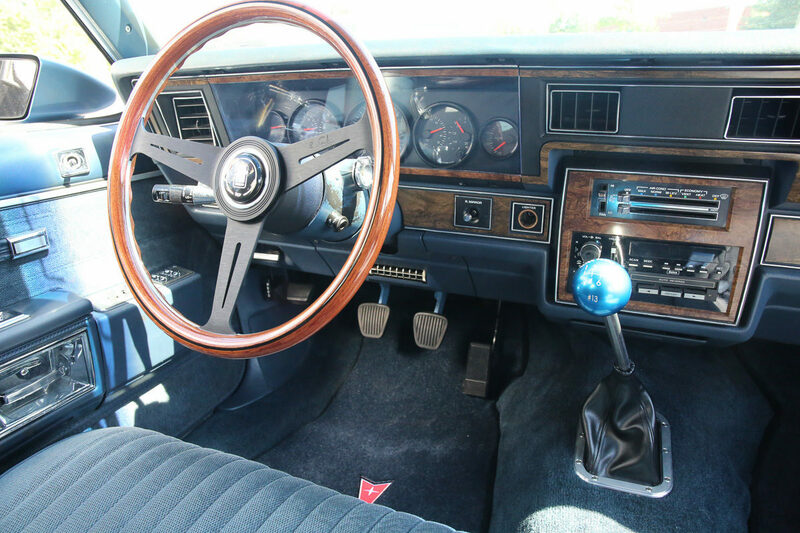 Turning to the gauges, we knew we needed a tachometer – GM thought a giant fuel level gauge was a better use of space. Speedhut to the rescue! They make a huge range of gauges and sizes, and will customize for a very reasonable price. We can help you get setup with just the right stuff. 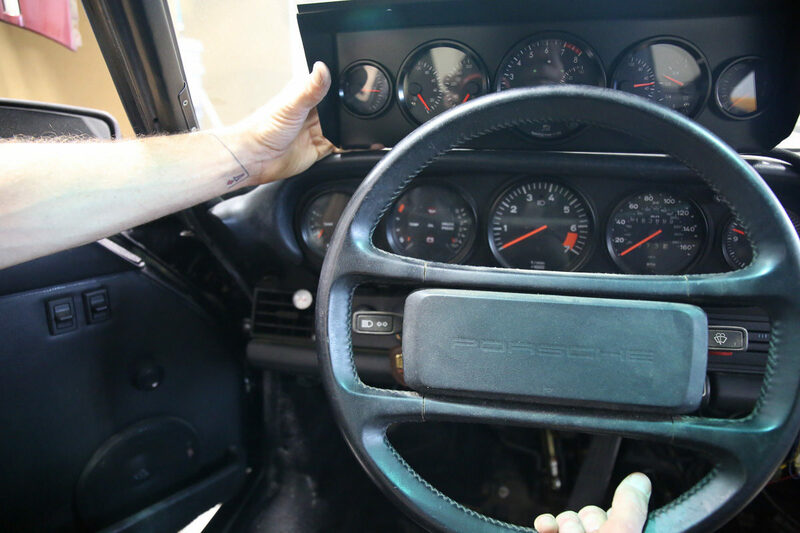 For inspiration, we drew from the 1987 Porsche 911 awaiting our attention in our engine build area. With a giant tach front and center, racing aspirations are clear. Works for us! 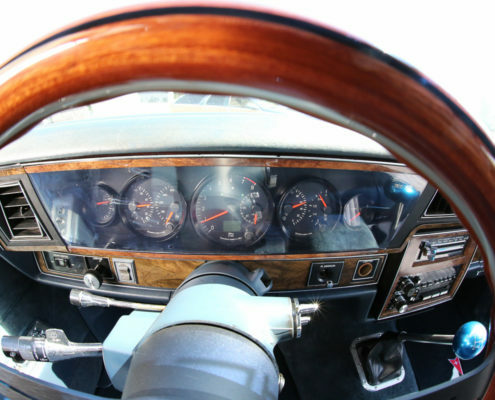 Speedhut makes a 4″ diameter tach and speedo combo gauge with a dominant tach. 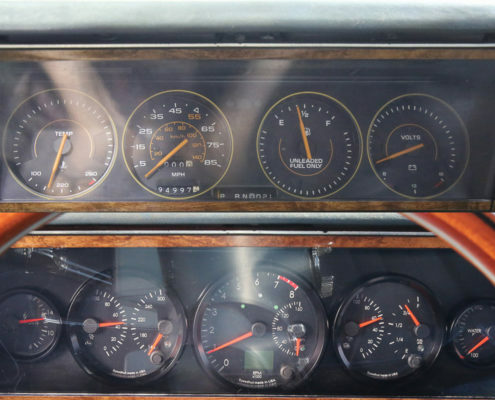 When we are curious about our road speed we glance at the digital readout instead of the analog portion. 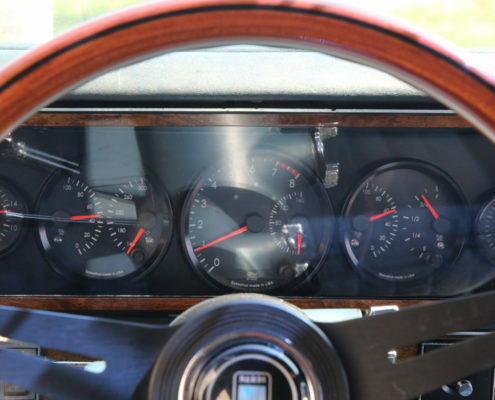 This gauge includes optional high beam and turn signal indicators. 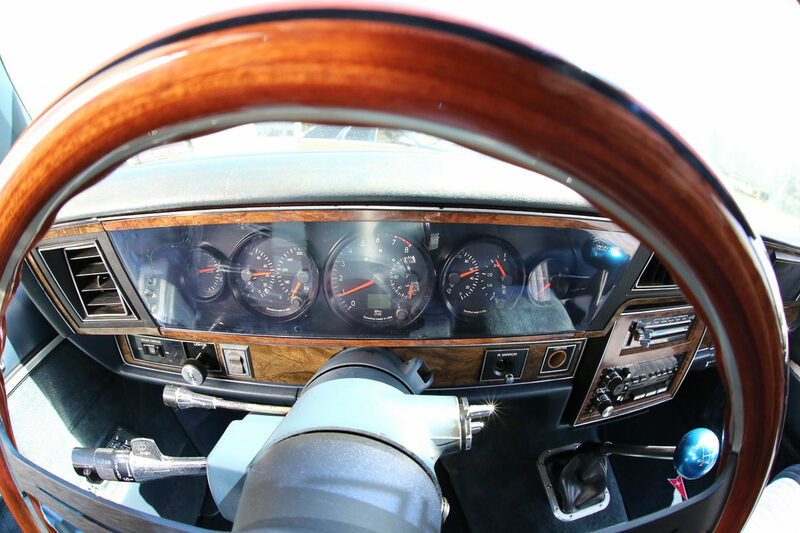 To the right of the tach we combined fuel level and fuel pressure gauges into one 3 3/8″ diameter pod and added a coolant temp gauge in 2 1/16″ diameter. 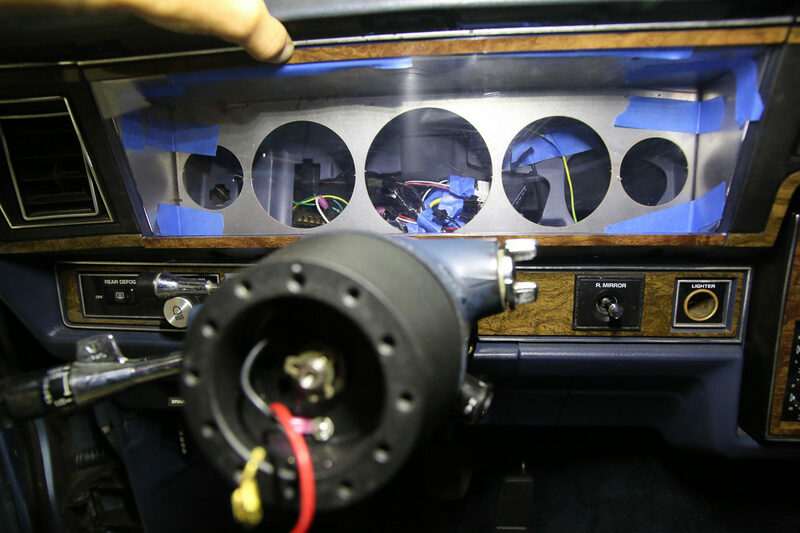 To the left, we combined oil pressure and oil temperature gauges into one 3 3/8″ pod and added a volt gauge in 2 1/16″. 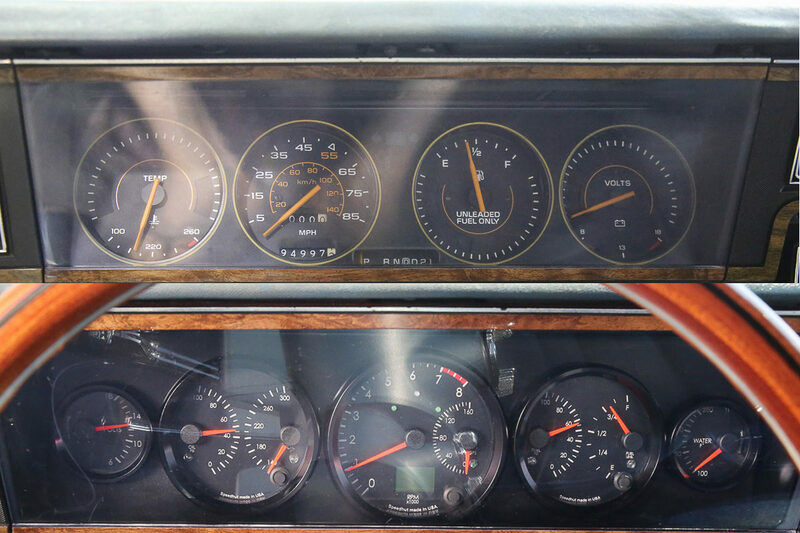 Eight total gauges in five pods. 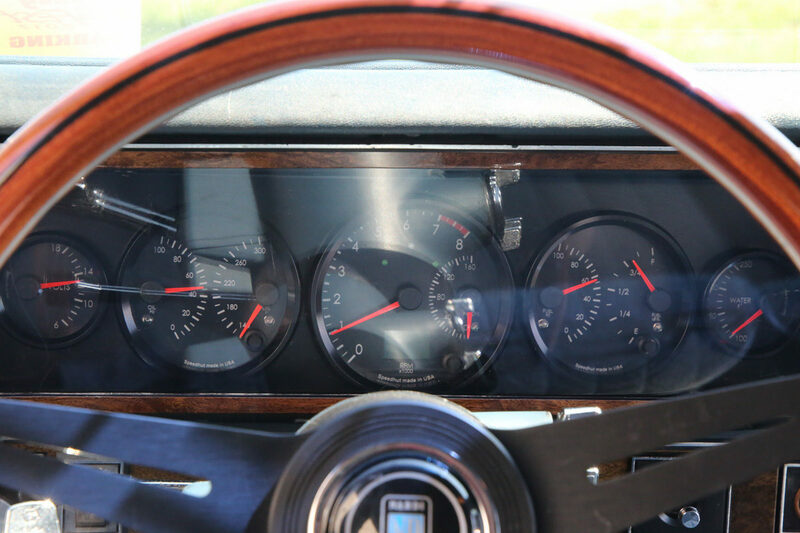 Much better than the stock four gauges. Twice as good, in fact. 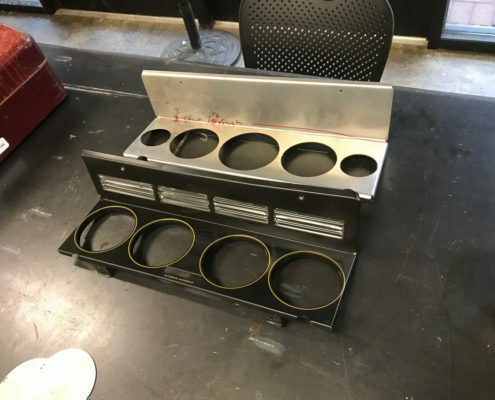 To install the gauges we fabricated a sheetmetal housing. 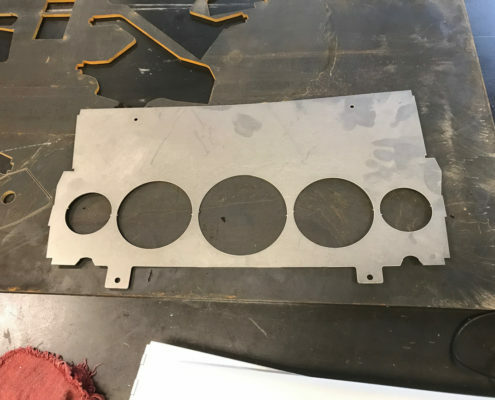 We got the design into CAD software and waterjet cut the piece. Then a little work with a sheetmetal brake and we were good. Final fit included adding a wing on each side. 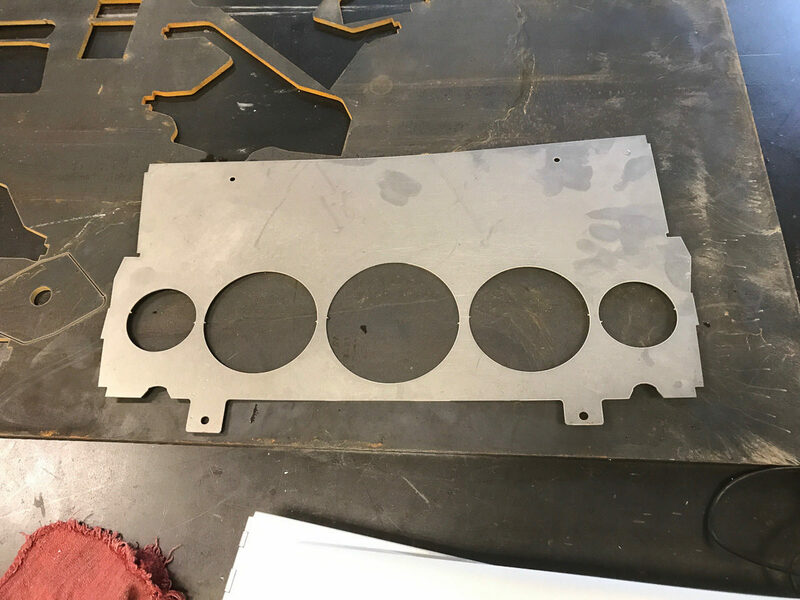 And proof that we did measure twice and cut once – the stock gauge cover, with flowing woodgrain stickerage, fits perfectly, helping to conceal our handiwork from casual observers. 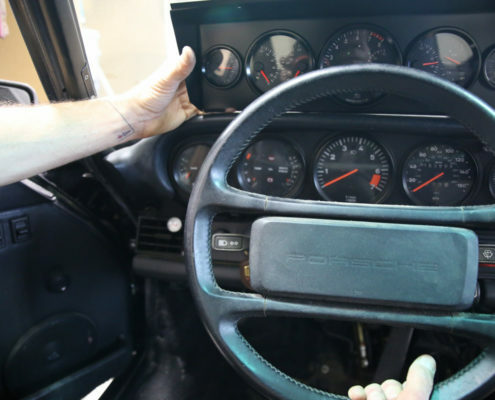 One of the coolest features of Speedhut’s gauges is that they are only 1” deep, which makes installation much easier. Other gauges can be 3” deep or more! 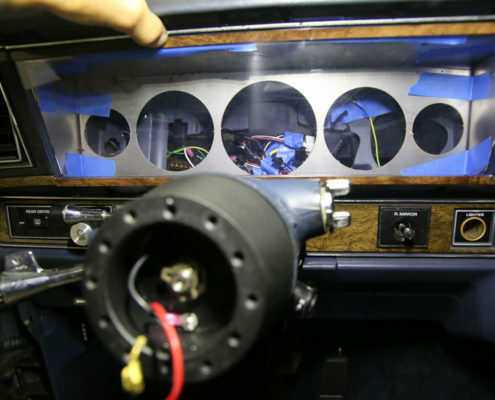 Wiring up the gauges takes some effort. We get the speedo signal from the included GPS sensor. 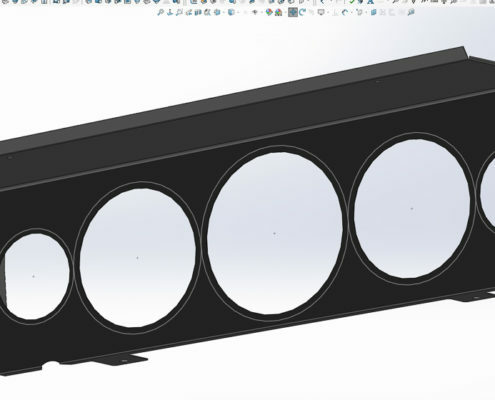 Most of the other sensors are included with the gauges and it’s a matter of finding the proper ports, and frequently procuring the proper t-fitting to plumb them in. 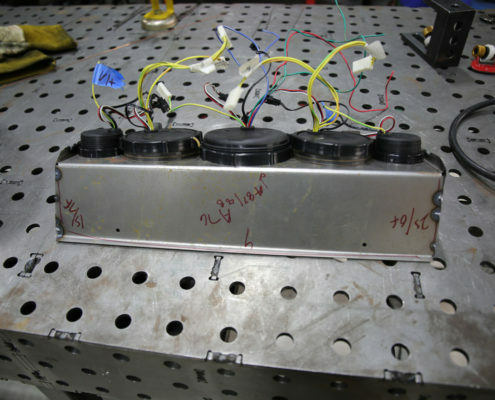 With our Mast ECU controlling our LS3, we tapped into its water temperature reading rather than adding a second sensor. 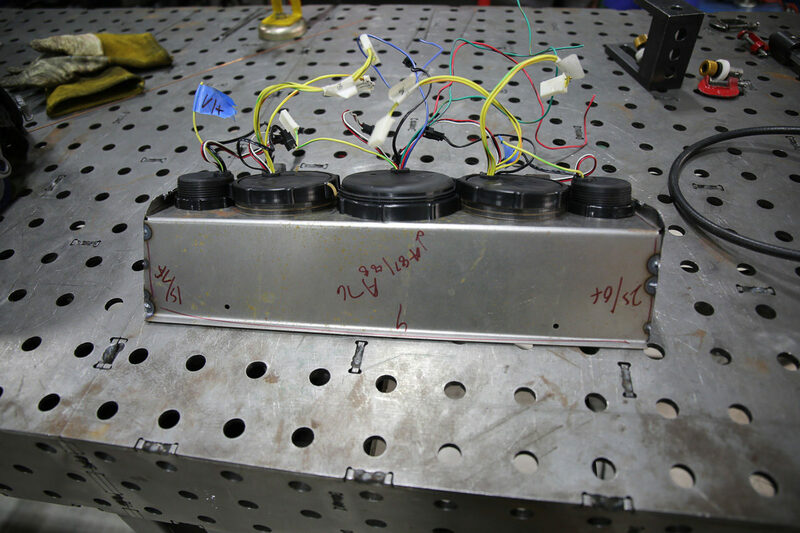 This requires a calibration process to ensure the systems are talking to each other. 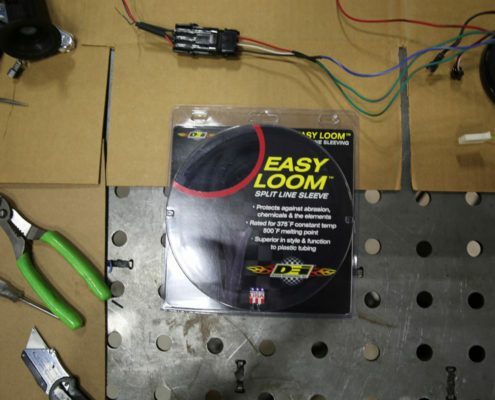 To protect all the wires we used DEI Easy Loom, which is pure awesomeness for when you want to protect wires which are already hooked up. 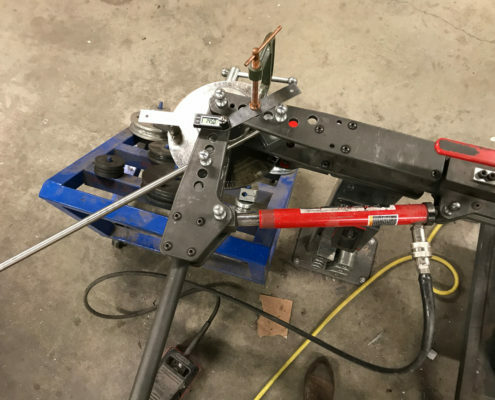 The alternative is to snake the wires into a sleeve, but that’s only doable before your connectors are crimped. 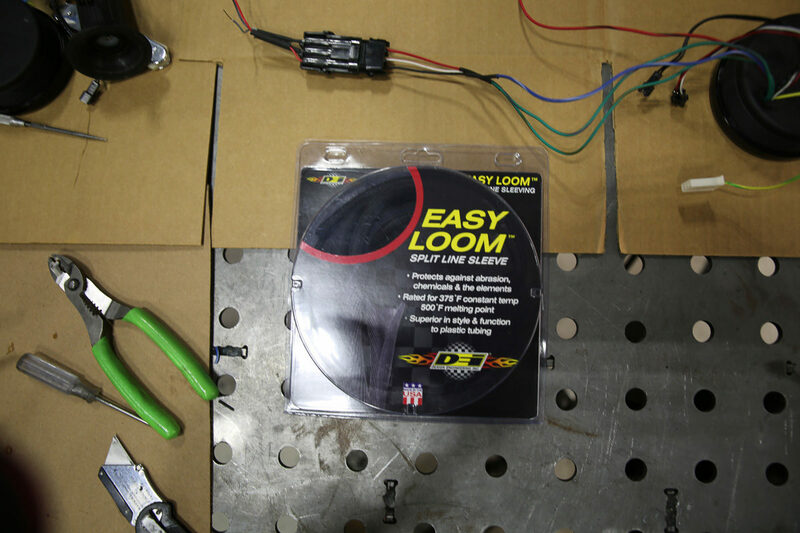 When grafting new stuff to old stuff we frequently use the Easy Loom to ensure we don’t rub some wiring insulation loose, cause that creates a major headache!